Potato salad as first course? Sure, when it’s as elegant and complex as this Stacked Purple Potato & Cucumber Salad recipe, from the Idaho Potato Commission. The recipe is a fusion of American potato salad and Middle Eastern tabouli (tabbouleh). Of course, you can still serve the potato salad, unstacked, as a side dish. 1. BRING salted water to boil in a medium pan. Add the red wine vinegar and then the diced potatoes. Cook until just al dente, then shock the potatoes in ice bath. Drain well and pat dry. 2. COMBINE the potatoes, parsley, olive oil, sherry vinegar, lemon juice, salt and pepper in large bowl. 3. PLACE a 4-inch ring mold in the center of each plate. Pack the potato mixture firmly into each ring mold. Reserve the extra vinaigrette in a bowl. 4. SPREAD the chopped cucumber on atop. Carefully remove the ring molds. Top the tabouli with mini cucumber (optional). Garnish plate with feta cheese and Asian greens. Drizzle the greens with remaining vinaigrette. FROM THE IDAHO POTATO COMMISSION. 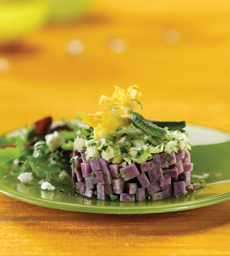 Purple Potato stacked potato salad (photo courtesy International Potato Commission). 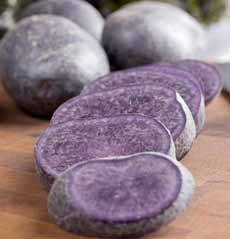 Purple Peruvian potatoes (photo Mona Makela | IST). 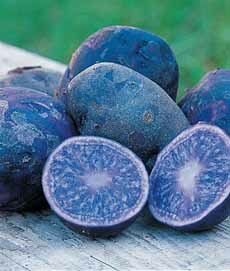 Blue potatoes (photo courtesy Burpee). *The miniature potatoes used as garnish in photo #1 have their blossoms attached. Unless you grow your own, you won’t find them in stores. Instead, you can substitute miniature gherkins.